Apply for one of five €/$1000 travel grants to use towards the cost of attending selected academic conferences in 2019! 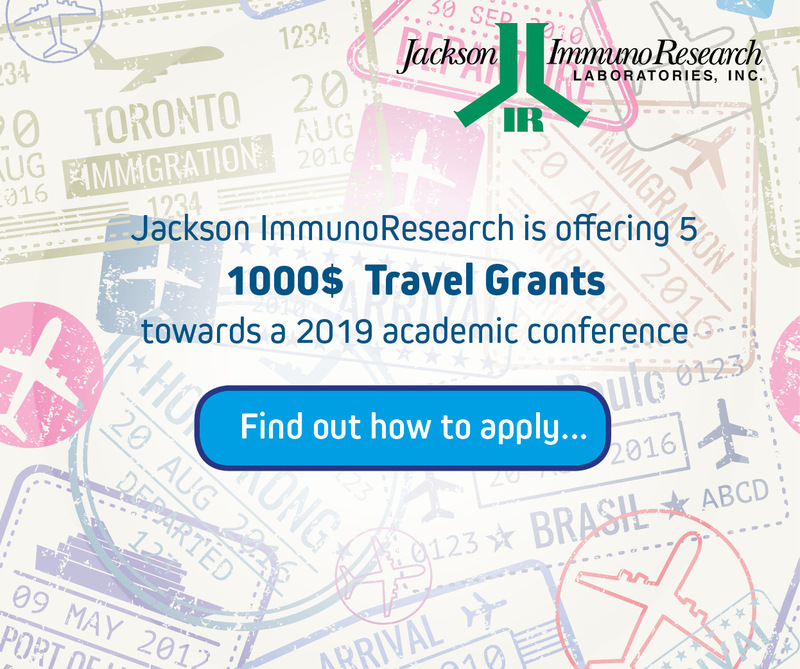 Jackson ImmunoResearch is delighted to offer travel funding to support researchers present, share and collaborate with colleagues. 5 awards of €/$1000 are available to put towards the costs of attending an academic conference in 2019. To apply for JIR’s 2019 travel grant, fill out the application form (here). The successful applicant will be selected by Jackson ImmunoResearch one week prior to the conference. Proof of attendance is required, see terms and conditions. 1. Travel grants will be awarded to support attendance at either, AACR 2019- American Association of Cancer Research, Experimental Biology 2019, AAI 2019- Immunology, NSH 2019- National Society for Histochemistry or SfN – Society for Neuroscience 2019 and no other events. 2. All applications must be submitted to Jackson ImmunoResearch using the online application between January 23rd, 2019 and October 12th, 2019. 3. Any researcher from an academic or non-profit institution is eligible to apply (Technicians, Ph.D./graduate students, Post-doctoral researchers, Principal Investigators). 4. Authorship on an abstract/poster presentation at the conference is not required. 5. Applicants must complete the application form in full. 6. Travel grants will not be awarded to employees of commercial organizations (i.e. biotech or pharmaceutical companies). 7. Travel grant recipients will be determined via a random draw by Jackson ImmunoResearch. 8. The recipients will be contacted by email according to the schedule and also announced online. 9. Travel grants will be paid to the laboratory of the award recipient’s principal investigator via the parent university or institution. If paid directly to the PI of the lab, taxes may apply. 10. Attendance at JIR’s booth at the requested conference will be required to receive travel grant payment and we request you write a short (250 word) summary of your conference experience. 12. Jackson ImmunoResearch travel awards are not affiliated with any society or scientific conference in any way. Colorimetric Western blotting Cite and win!